Riding for SKIL Team, managed by Jean de Gribaldy, 1984. Caritoux was born in Carpentras in Provence at the foot of Mont Ventoux. He first started cycle racing as a junior with the local club in Carpentras, he developed into a strong climber riding in the hilly Vaucluse region and often using Mont Ventoux in his training rides. 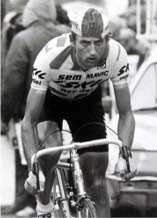 As an amateur Caritoux won the 1982 edition of the Tour du Vaucluse Open beating future Tour de France winner Laurent Fignon into second place, he clinched that victory by winning the 15 kilometre mountain time trial up Mont Ventoux between Bédoin and Chalet Reynard. That win persuaded Jean de Gribaldy manager of the Sem-France Loire professional squad to sign Caritoux for the 1983 season. The 1983 SEM team had Sean Kelly as team leader and Caritoux soon fitted into the role of Kelly's main helper in stage races. In 1984, Skil became main team sponsors (making the Skil-Sem team) and Éric showed that he had potential to be more than just Kelly's helper in the mountains, he started the season by taking the Tour du Haut Var, a tough hilly one day race in the south of France and then won the Orange to Mont Ventoux stage of Paris–Nice. He was then given a short break in early April by his manager as the team concentrated on the spring classics for Sean Kelly, races which did not suit Caritoux. The story of Caritoux's victory in the 1984 Vuelta a España is quite extraordinary in that he won a Grand Tour as a second year professional which is quite unusual. However, even more unusual is that, one week before the start, neither Caritoux or his team had any intention of actually riding the race. At that time the Vuelta started in the second half of April and the Skil manager Jean de Gribaldy had made a promise at the start of the year to the Vuelta organisers that his team would be on the start line. A promise he had forgotten about but the organisers had not, de Gribaldy was threatened with a £50,000 fine if the team did not ride, he had to scrape together a squad for the Vuelta at the last minute, this included the holidaying Caritoux, who was told to get to Geneva and then fly to Jerez de la Frontera in the south of Spain where the Vuelta was starting. Caritoux rode himself into form and won the race's first mountain stage which finished on top of the Rassos de Peguera in the Pyrenees, he then rode admirably on stage 12 which finished at the Lagos de Covadonga summit and took over the leaders yellow jersey from Pedro Delgado. Nobody, including Caritoux himself, thought he could hold the lead until the race finish a week later, his team was weak and he had no support in the mountains. However, Caritoux did hold the lead and went into the final day with a 37 seconds lead, the final stage was a time trial, Caritoux was no time trialler and nearest rival Alberto Fernandez was. Caritoux rode the time trial knowing this might be his only chance to win a major race, his determination came through and won the 1984 Vuelta a España by a mere six seconds. Caritoux joined the poorly organised Fagor team in 1986 and had two years of modest results, he rejoined Sean Kelly in 1988 at the Kas squad and had more success, taking the French road race championships. In 1989 he joined RMO to work with team leader Charly Mottet and repeated his French championship win. He stayed with RMO until the team folded in 1992 and then switched to the small Chazal team run by manager Vincent Lavenu for the final two years of his career, Éric was team leader at Chazal and mentor for the team's younger professionals of which the team was mostly composed of. In 1994 the Tour de France's 15th stage finished in Eric's home town of Carpentras and he was hoping to grab glory in his final year as a pro, however he was foiled by lone breakaway Eros Poli, Caritoux finished in a group with race leader Miguel Indurain at two minutes behind Poli. Eric Caritoux retired from professional cycling at the end of the 1994 season at the age of 34. He today owns his own vineyard and holiday business in the Carpentras area and has recently worked on the Tour de France as a courtesy driver for the guests of France Telecom. Stage 4 Tour du Vaucluse. Stage 2 Tour de l'Ain.